So, I know what you're thinking. Seattle scuba diving? Why dive in Seattle when I can go to Hawaii, or the Caribbean, or blah, blah, blah. Why should you dive in Seattle? Because there is something very unique about spending some time under the water in the Northwest. I don't want to take anything away from those other places. I mean, hey, I've been to some of those places, too, and loved them. But if you're looking for something a little different, scuba diving in the northwest might be what you're after. How is Seattle diving different? So what makes Seattle scuba diving different from other places? Well, for one, the water temperature is a lot colder. (Dry suit tend to be the norm around here.) 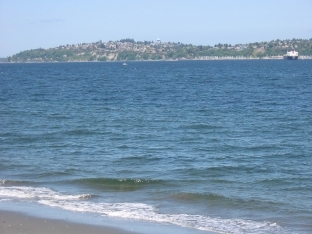 Second, the currents are constantly changing in and around Seattle. Because of this, there is a lot of diversity in the marine life with animals you wouldn't see anywhere else. For starters, you've got the Six Gill Shark, the Giant Pacific Octopus, and the unforgettable Wolf Eel. Follow that up with sea anemones, sea urchins and the Dungeness Crab (which might be disappearing, by the way) and you've got some pretty dense marine life. Even though diving in Seattle can be a very unique experience (similar to kayaking in Seattle, it's important to realize that if it's your first time in the region, taking someone along who knows a little about Seattle scuba diving can help to make it the best experience possible. Sometimes the visibility can vary and it's probably best to see if you can dive with a local diver who understand how the current is behaving, as well as the different tide conditions that might be occurring. One of the cool things about scuba diving in Seattle is that there are a good number of places where you can go. Whether you're interested in a day trip dive on the Sound, taking a ride out to the San Juan Islands for some diving, or doing a morning beach dive at Keystone Jetty or Alki Junkyard, you've got choices. Click on the "Fun Dives" link and you'll find some places you can go and some people to go with. If you're looking for some new or used equipment, this place can help you out. Another place with a listing of dive trips and outings you can join. Seattle scuba diving is definitely alive and if you're looking for something exciting to do on your next trip to the northwest, consider doing some diving (or even snorkeling) there. You'll be able to see some cool creatures you won't get anywhere else and have a blast doing it. Back from Seattle scuba diving.